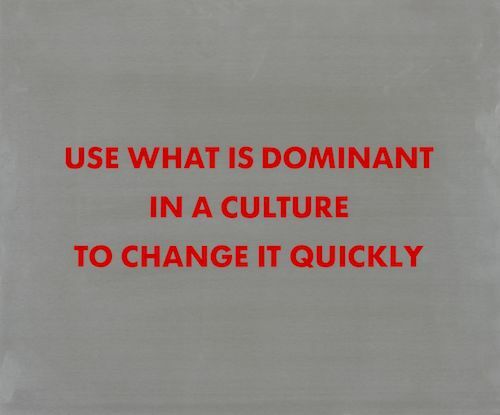 The Center for Contemporary Art & Culture at Pacific Northwest College of Art (PNCA) is honored to present Use What is Dominant in a Culture to Change it Quickly: Jenny Holzer’s Sentences and Sentiments from the Collections of Jordan D. Schnitzer and His Family Foundation July 19 through August 22, 2018. This exhibition is presented as part of Converge 45: YOU IN MIND 2018 and is part of the Jordan D. Schnitzer Exhibition Series at the Center for Contemporary Art & Culture in conjunction with PNCA’s MFA in Print Media program. There will be an opening reception for the exhibition Thursday, August 9, 2018 at 5-7pm. The works in the exhibition are primarily text-based works selected from the Jordan D. Schnitzer and His Family Foundation collection on the basis of their prescient vision regarding contemporary political currents and regimes. Holzer’s works presented here stand as a dark prophecy that she future-cast nearly 40 years ago, making sense of the second decade of the 21st Century from the perspective of the late 1970s. Here too, one finds signposts of support, such as the title of the exhibition, Use What is Dominant in a Culture to Change it Quickly, taken from one of the works in the collection. Holzer’s projects are wry, provocative, and outrageous in one moment, while in the next they can be compliant, witty, and agreeable. Through their creation and far reaching distribution, Holzer has seeded inspiration for generations of artists and citizens. For more than forty years, Jenny Holzer has presented her ideas, arguments, and sorrows in public places and international exhibitions, including 7 World Trade Center, the Venice Biennale, the Guggenheim Museums in New York and Bilbao, the Whitney Museum of American Art and the Louvre Abu Dhabi. Her medium, whether formulated as a T-shirt, a plaque, or an LED sign, is writing, and the public dimension is integral to the delivery of her work. Starting in the 1970s with the New York City posters, and continuing through her recent light projections on landscape and architecture, her practice has challenged ignorance and violence with humor, kindness, and courage. Holzer received the Leone d’Oro at the Venice Biennale in 1990, the World Economic Forum’s Crystal Award in 1996, and the Barnard Medal of Distinction in 2011. She holds honorary degrees from Williams College, the Rhode Island School of Design, The New School, and Smith College. She lives and works in New York. Converge 45 is a curatorial-driven arts platform that engages audiences and artists in Portland, Oregon, connecting the city in a global dialog through the vision of leading curators. This multi-year cycle and four days of extended programming (August 9 – 12) has been headed up by Guest Artistic Director Kristy Edmunds, Executive and Artistic Director of the Center for the Art of Performance at UCLA. Edmunds’ theme of You in Mind has driven the curatorial direction of this series of exhibitions and events. The “you” in the theme encompasses a focus on the artist, their needs and values, and Oregon’s unique qualities for working artists, as well as art practices that have a “public” in mind. About The Jordan D. Schnitzer Exhibition and Visiting Artist Lecture Series The Jordan D. Schnitzer Exhibition and Visiting Artist Lecture Series presents an annual curated exhibition from the dynamic and expansive collection of more than 12,000 contemporary prints of Jordan D. Schnitzer and the Jordan Schnitzer Family Foundation at the Pacific Northwest College of Art 511 Gallery. The series brings an invited artist in connection to the exhibition to engage with PNCA students, faculty, and the public through lectures, studio visits, and collaborations with the MFA in Print Media program. In addition to the Exhibition and Visiting Artist Series, selections from the Collection will be lent to the PNCA Object Library to be studied by students and faculty on a regular rotating basis.